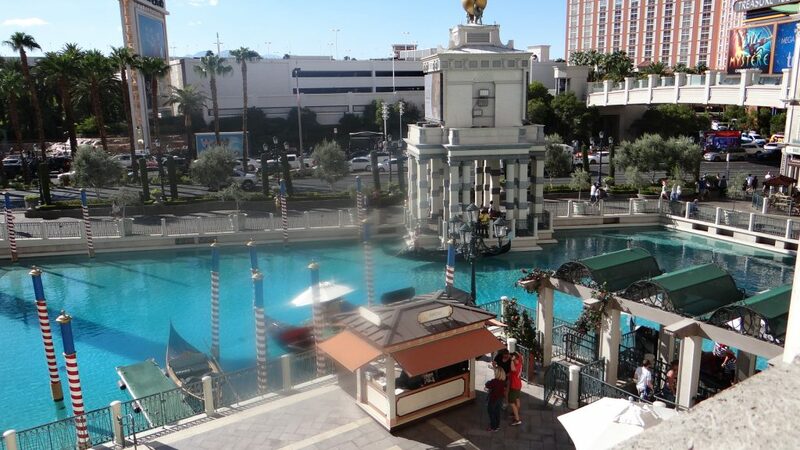 We arrived in Las Vegas not really knowing what to expect. Neither of us gamble, slot machines don’t interest us, so I guess you could say we weren’t sure why we were there apart from everyone saying we must visit it. It also didn’t help that we arrived in temperatures that were touching 100F (38C+) and over. 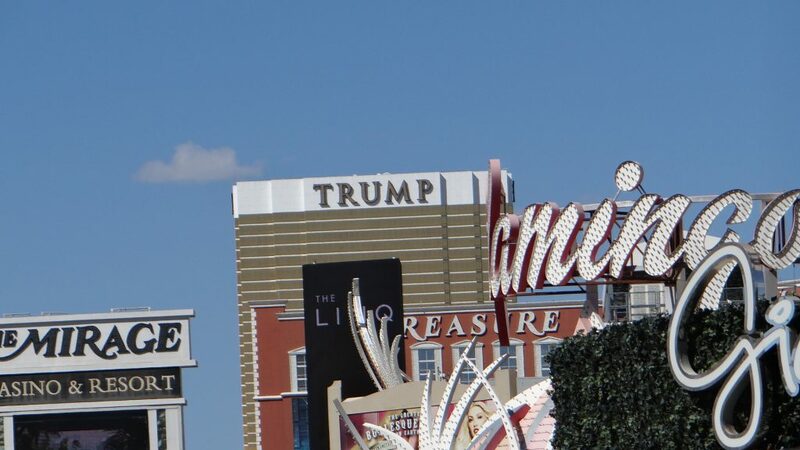 We decided to drive into “the Strip” and see what it was all about. 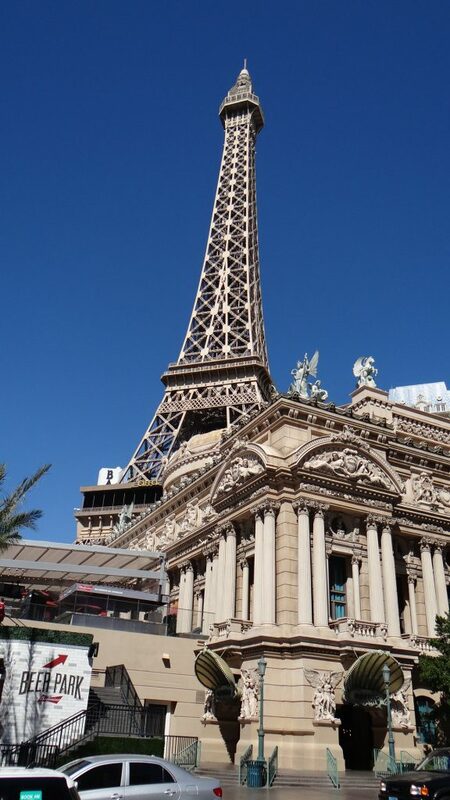 After driving up and down the strip and witnessing the mayhem we decided to park and have a walk around. 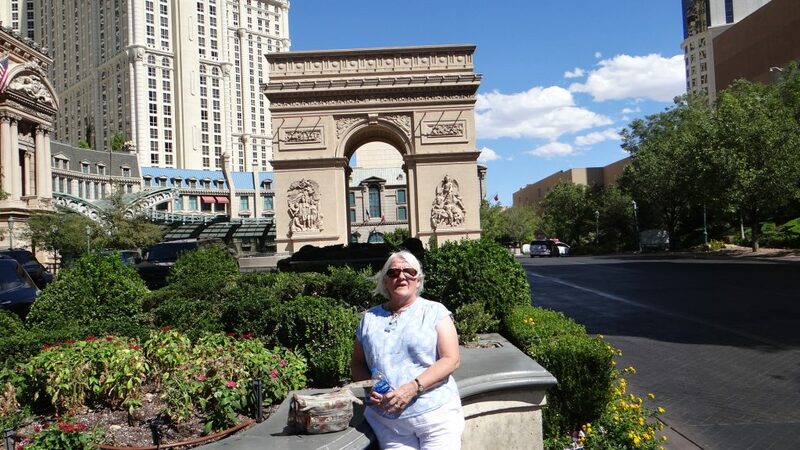 We came out from the parking lot roughly in the middle of the Strip near the Paris casino and then walked down to the Venice casino (with its canals and gondolas) and then walked back up the other side to see Caesar’s Palace and the fountains outside the Bellagio casino. 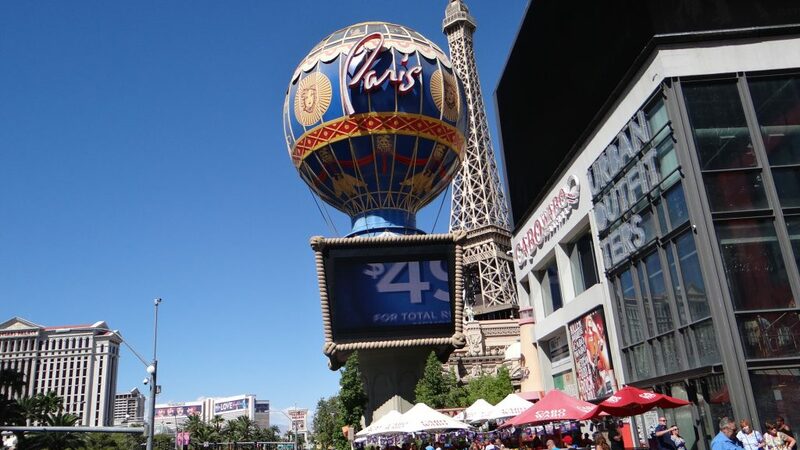 Paris with a Montgolfier balloon. An Arc de Triomphe. You can see how hot it is. 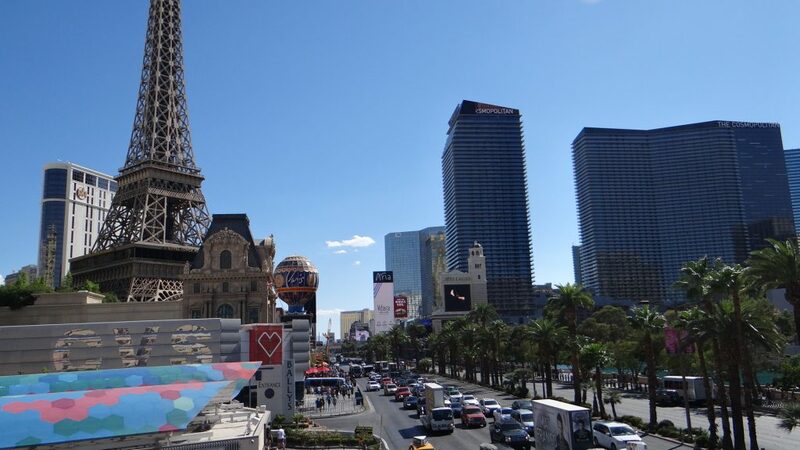 Looking down the Strip back towards Paris. He has a tower here too!! 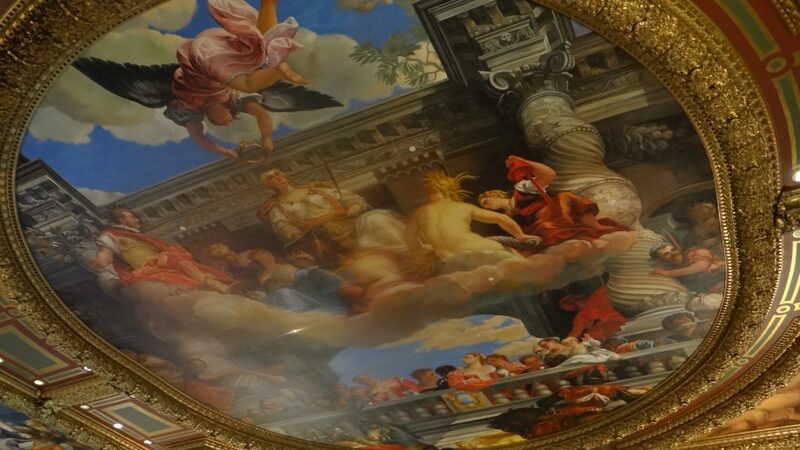 The mural on the ceiling in the Venice Casino (apologies for the blur hadn’t realised I touched the lens). 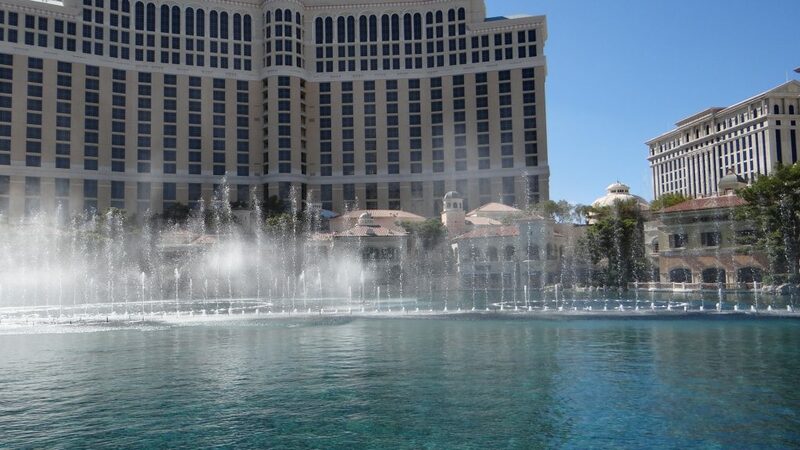 I also took a video of the Bellagio fountains performance of “Hey Big Spender”. After that I must admit we had to give up as it was just too hot, even after using the air conditioning in the casinos to cool off. 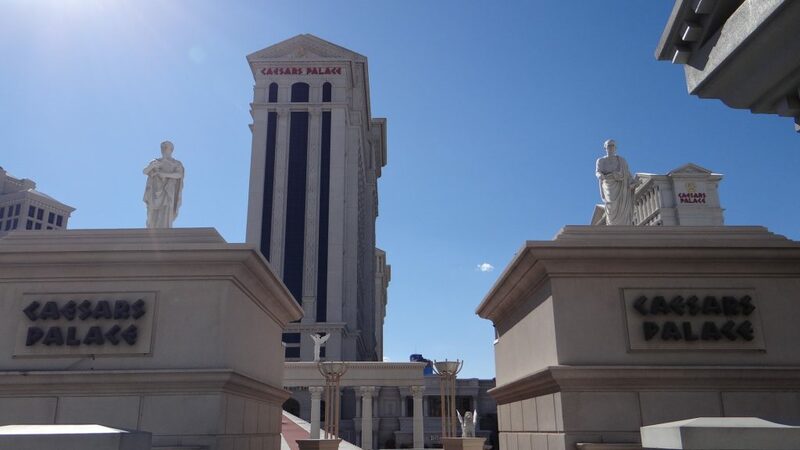 Some of the casinos and their accompanying themes were very interesting but overall impression was, its very brash, over the top, frenetic and not for us!! 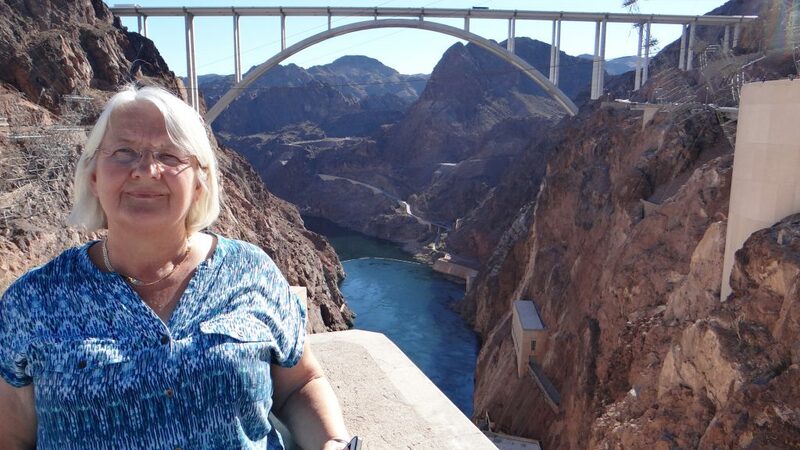 Even though it was just as hot on the next day we decided to go and visit the Hoover Dam. 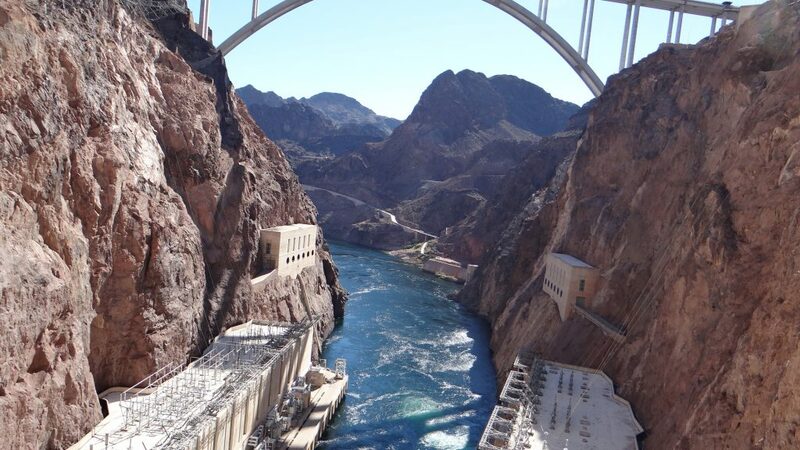 The dam was built between 1931 and 1936 and at its peak over 5,000 men worked there on a daily basis. 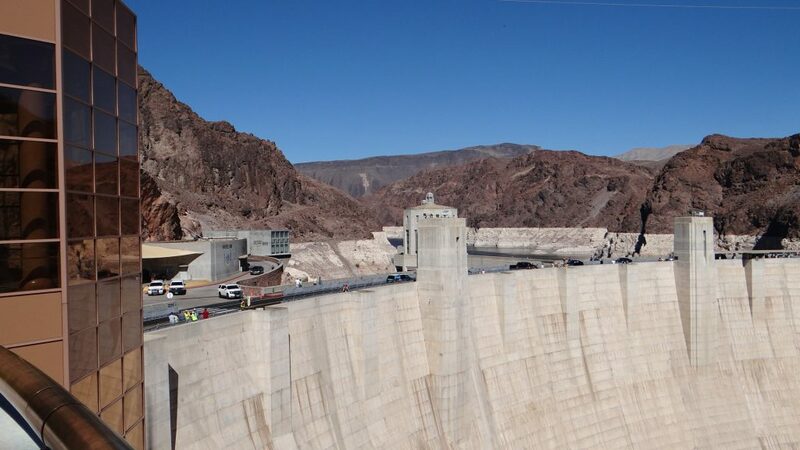 Until the early 1950’s it was the tallest dam in the world at 726.4ft high but since then it has been relegated to 30th place although it is still the second largest in the USA. 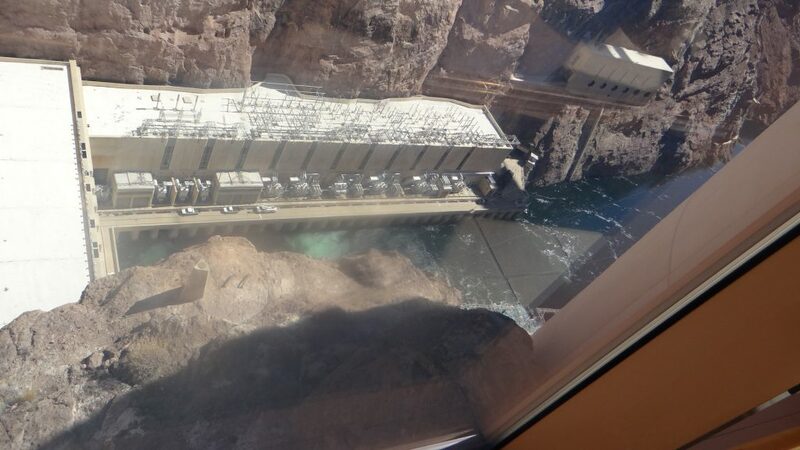 When it was built, so much concrete was poured in such a short time, they had to build a refrigeration system to cool the concrete to allow it to set. Lake Mead the reservoir created by the dam is still the largest in the USA. 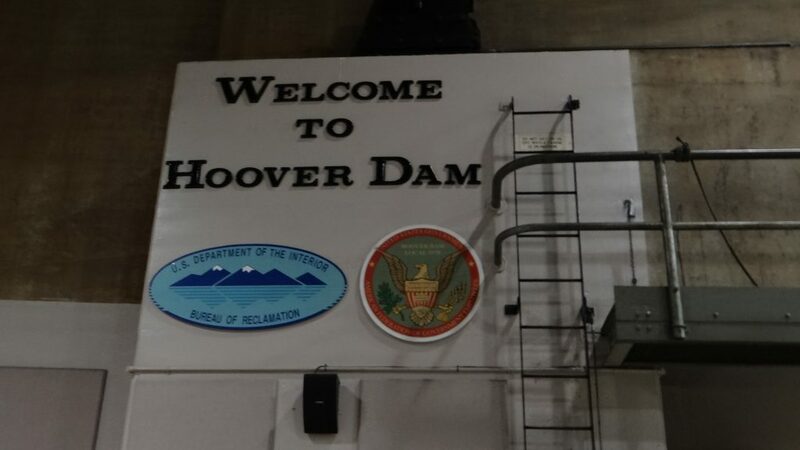 We took a tour of the dam that allowed us right into the middle of the dam in some of the tunnels that are still used for maintenance. 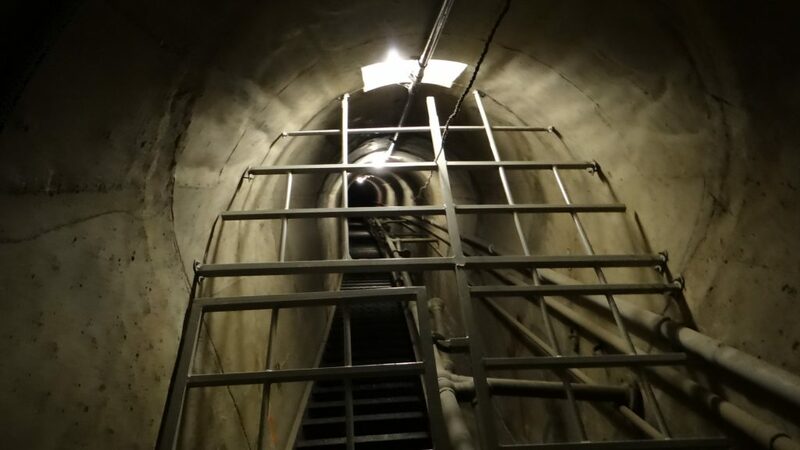 If you ever decide to do this I hope you don’t suffer from claustrophobia as some of these are very narrow and deep inside the dam. 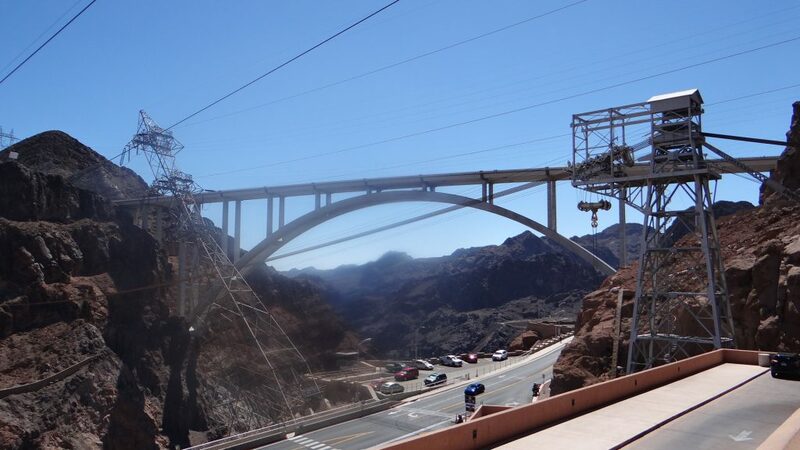 The original highway across the top of the dam (bottom of the picture) was replaced by the highway on this bridge which we crossed in the RV on the way to Williams and the Grand Canyon. 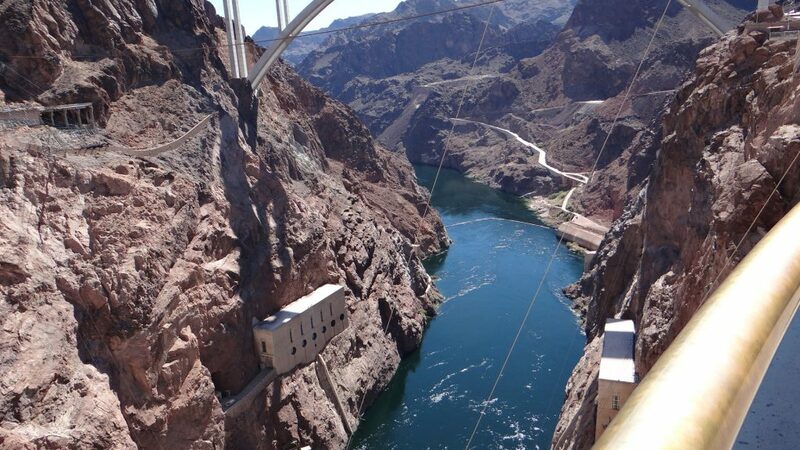 Looking down onto the Colorado river existing the dam. The dam wall down to the generating houses over 700ft below. 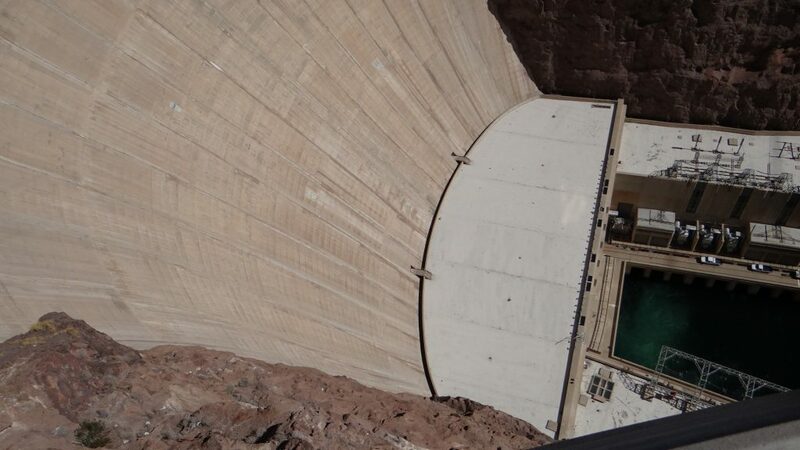 The Colorado river beyond the dam. 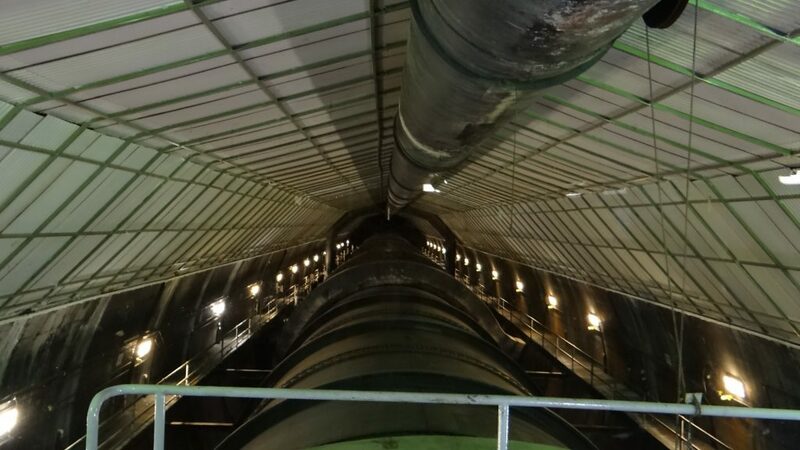 One of the massive pipes that feeds water from the reservoir to the turbine halls. 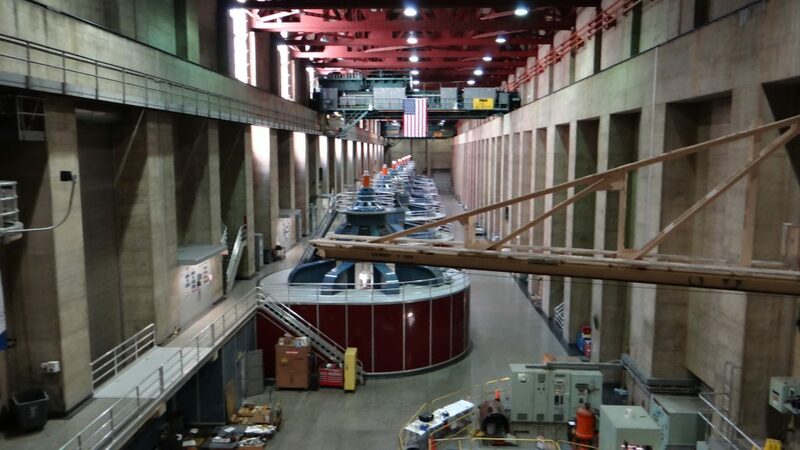 One of the turbine halls containing 8 turbines. The other contains 9 turbines. The Welcome message in the turbine hall. A tunnel deep in the dam. 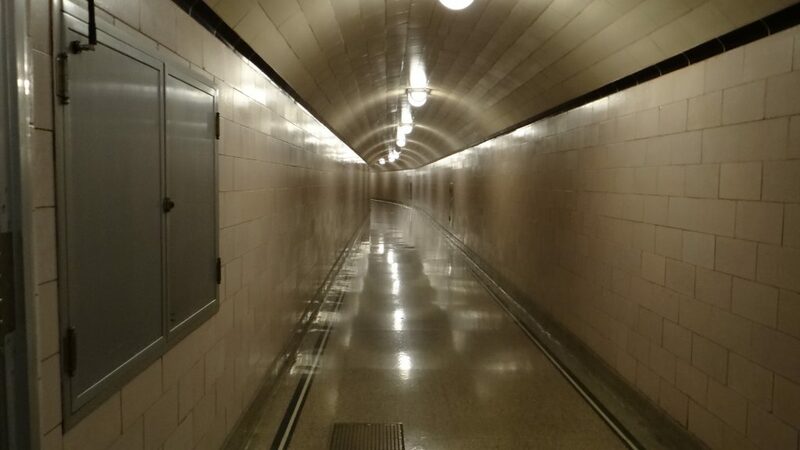 One of the maintenance tunnels leading up and down the dam. Look at all the stairs!! This picture was taken at about 300ft down the dam from a tunnel that leads from the previous tunnel to the dam face. 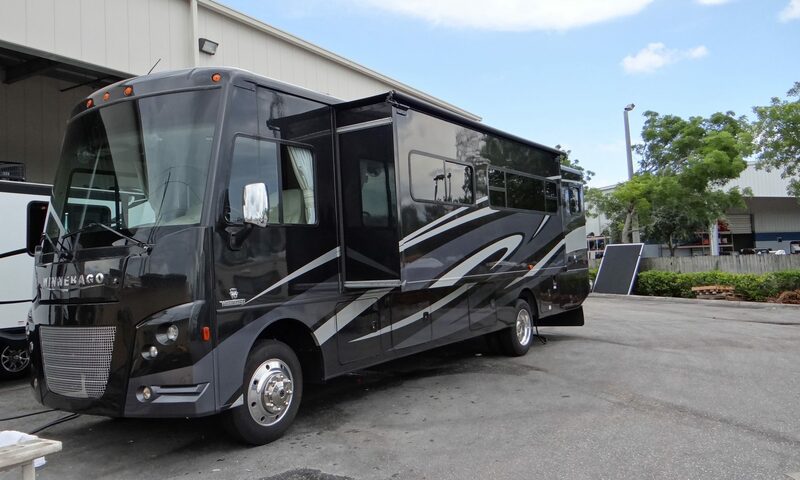 Just enough room for two people to pass each other. Thank goodness for lifts, wouldn’t have fancied walking up all the stairs!! View along the top of the dam. The lift was in the second tower along. The view of the bridge and river from the top of the dam. 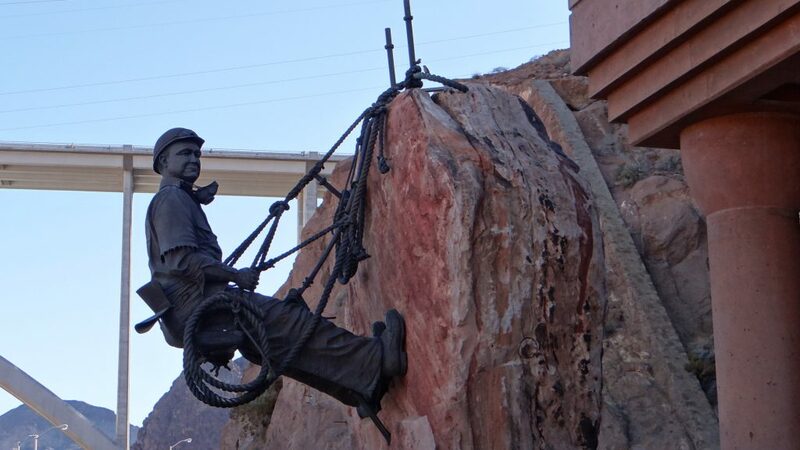 A statue commemorating “high-scalers”, men employed to remove loose rocks etc. from the canyon walls so they didn’t fall on the workforce below. They worked by abseiling from the top of the canyon over 1,000ft above the canyon floor. Some of them became very famous by entertaining the public who came to watch the dam being built. As I said earlier our next stop was to be Williams, to visit the Grand Canyon and Route 66. All of this and more in my next post.